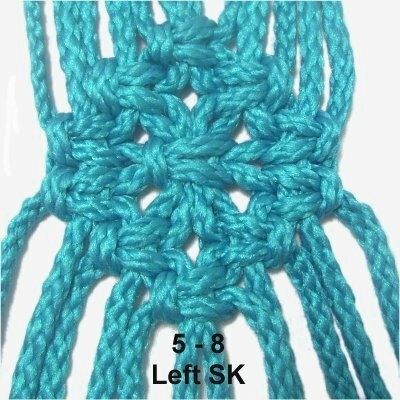 Description: The Snowflake design is made with Square knots (SK) that are arranged to form a rounded diamond shape. 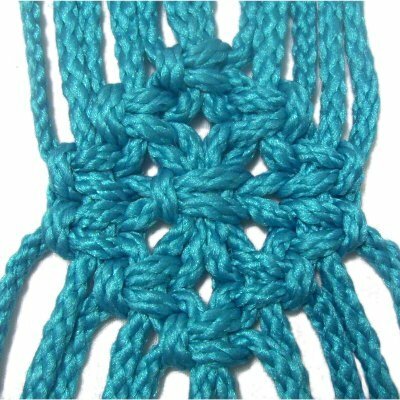 There is a thick Square knot in the center. This pattern is a vintage technique, seen in older patterns written in the early to mid-1900's. It can be found in plant hangers, curtains, wall hangings and more. 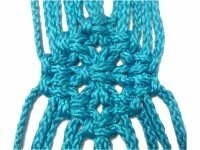 The best time to use this design is when you can place it in a Macrame project that has open areas, so it's not surrounded by other knots. It will be a lot more obvious. 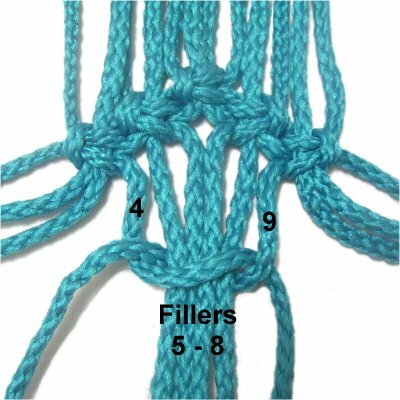 You can even use this macrame technique as a focal point in a bracelet or necklace project, since it can be made any size. 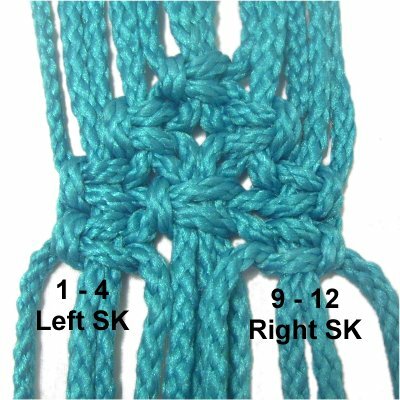 This pattern requires you to tie both left and right Square knots, so make sure you practice if you are not familiar with tying them in both directions. The Snowflake Hanger features this design in the long posts as well as the cradle. Click on the link or image if you want to give it a try, after you have practiced at least once. Step 1: Cut 12 cords, each at least 36 inches long. Secure them to a project board with pins. Mentally number the cords 1 - 12. Tie a LEFT SK with cords 5 - 8. Step 2: Use cords 3 - 6 to tie a LEFT SK. 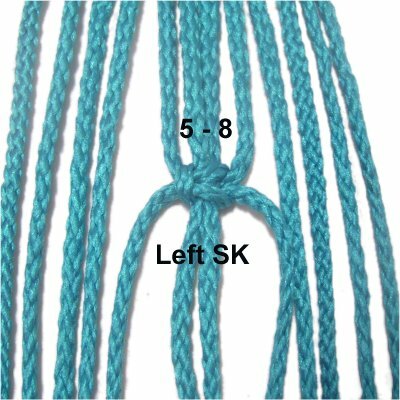 Use cords 7 - 10 to make a RIGHT SK. Step 3: Tie a LEFT SK with cords 1 - 4. Tie a RIGHT SK with cords 9 - 12. Step 4: The Snowflake design features a LEFT SK in the center, which is thicker than the others. 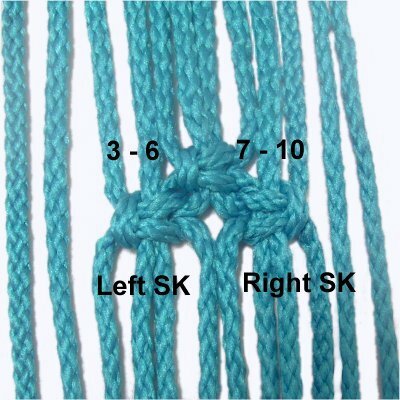 Use working cords 4 and 9 to tie another SK around cords 5 - 8, which are the fillers. Tighten the knot so the top edge of it lines up with the Square knots from step 3. Step 5: Tie a LEFT SK with cords 1 - 4. Step 6: Use cords 3 - 6 to tie a LEFT SK. 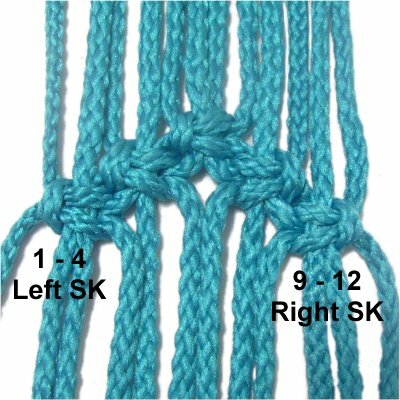 Use 7 - 10 to tie a RIGHT SK. (This is the same as step 2). 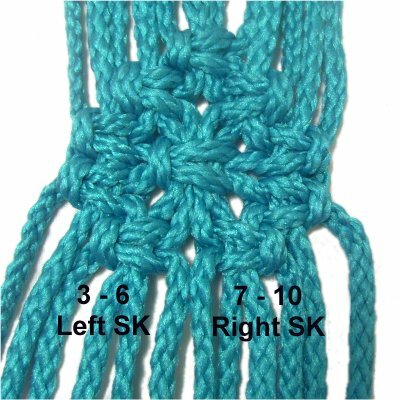 Step 7: To complete the Snowflake design, use cords 5 - 8 to make a LEFT SK. (This is the same as step 1). Have any comments about the Snowflake Design? Contact Me.